Factors comprising overall sales satisfaction! J.D. 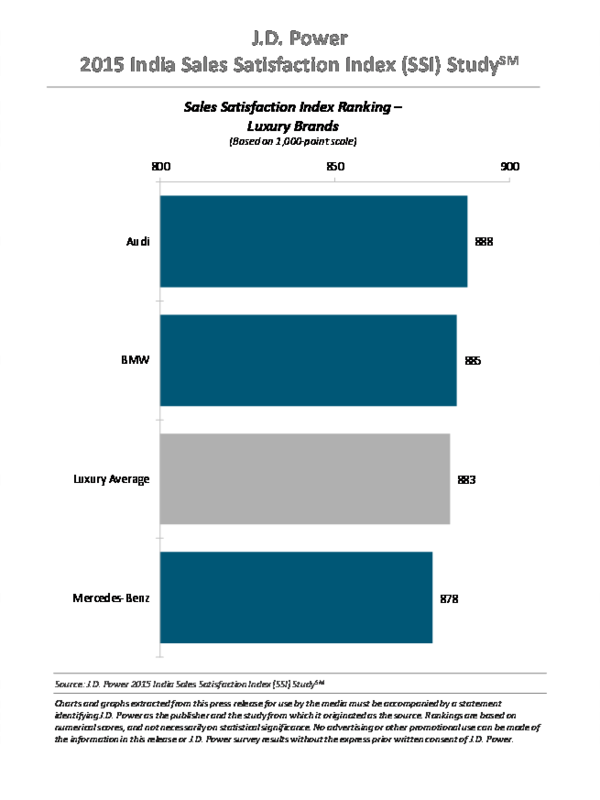 Power Asia Pacific has today released a study on sales satisfaction among Luxury automotive brands in India. According to the study, luxury-vehicle buyers in India are actively involved in the shopping process. The average time to complete the sales transaction has increased to 10 days in 2015 from nine days in 2014, and the time for vehicle delivery has increased to 12 days after booking in 2015 from 10 days in 2014. Reveals that there is an increased traction/bookings for the car and the delivery of the car is delayed because of lack in supply – one of the reasons is the car production in the manufacturing plant as per the requirement! Communication on the committed delivery time is one of the activities that helps improve relationship with customers. The overall satisfaction among the 82 percent of customers who receive regular communications from their dealership during the purchase process is 887, which is 21 points higher than among those who do not receive regular communications. Another important factor to consider is the Post-sales feedback that increases the amount of engagement with luxury vehicle buyers. Overall satisfaction among the 84 percent of luxury-vehicle owners who are asked for their feedback regarding the buying experience is 886, compared with 870 among those who are not asked for feedback. Mahindra XUV100 to compete against Renault Kwid?